The Fragile X Files: Was that it? Remember how I've been waiting for a "wow" moment, during this drug trial? Something that would make me think this drug trial is working? I might have had it this week. AJ did something that made me say "wow." Now, it didn't make me say "WOW!" Just "wow." Anyway AJ found it, picked it up, looked it over, and promptly ripped the back off the box. And I ran over to him yelling "No, don't rip that up!" And AJ handed it to me and said, "Sorry." It definitely made Aliza and I both sit up and look over at him in amazement. Before this, though, I would have sworn they were both on the placebo. This past weekend we tested them with our annual trip to see Santa, something that historically both boys have a terrible time with. Mark works to keep them from escaping while we wait in a short line. This one, though, is all set to see Santa, list in hand. Trying to get a good picture of Santa with the kids. Well, not necessarily a good picture. We'd settle for something where everyone in the shot is actually facing the camera. This is about as good as it was going to get. A lot of parents of little Fragile X kids don't do the Santa thing. It's really hard for them, being forced to get up close and personal with this odd looking stranger. And often they don't "get" Christmas and Santa and the whole thing. But we have always done it. Every year. It's a bit of a tradition for us. 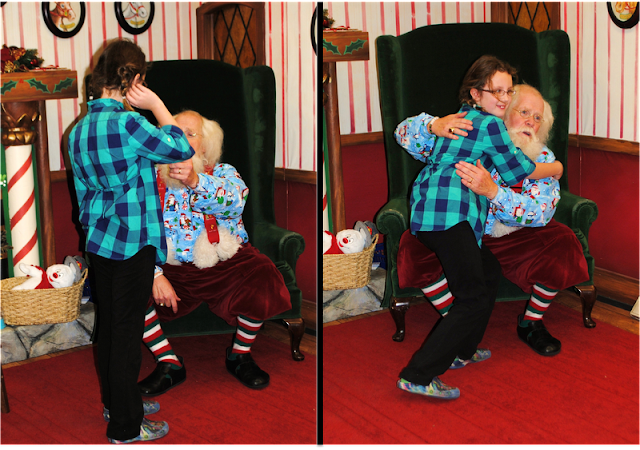 It's important to me to try, every year, to show the kids the magic of Santa Claus. And this man, this Santa - oh, he's special. He remembers us. He remembers that the boys have a very tough time and more importantly, he remembers Aliza, and what a superstar big sister she is. And while the boys chew, chew, chew on their chew toys and obsess and panic and scramble to get away, Aliza stares at Santa, with stars in her eyes. And that makes it worth everything. Thank goodness, we're back home, watching Little Einsteins. Standing on your head makes it look so much better.